I’m a bit of a hermit. I like my private space private. If I want to scratch or talk to myself, I don’t want to share it with the neighbors. I also spend a lot of time in my garden—musing, reading and talking on the phone. I have a fence that’s leaning and an expansive view of the neighbor’s garage across the street. They drive a blue Prius and a couple of bikes are suspended from the ceiling. I don’t much care for their easy-maintenance garden, but that’s just me. But while I was trying to figure out how to shield my privacy, here comes a book from Timber Press, one of my favorite publishers. 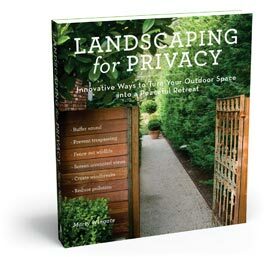 Among their spring catalog is author Marty Wingate’s Landscaping for Privacy: Innovative Ways to Turn Your Outdoor Space into a Peaceful Retreat. Marty organizes her book in three ways: buffers, barriers and screens. What’s noteworthy about these methods is that they permit differing degrees of visual and sound protection. If you’re not dealing with a hideous view and just want a heightened feeling of privacy, then all you need is a screen of some sort — maybe a trellis or a picket fence. If, on the other hand, you have a looming-garage situation, then a barrier is definitely the way to go. Throughout the book, Marty provides scores of examples that you can re-create or draw inspiration from. If you’re at your wit’s end about how to make your yard feel like it’s really yours, then Landscaping for Privacy will show you the way.